The Student Switchboard on YouTube! Hi everyone! Hope you’ve been having a lovely Monday so far, and are feeling refreshed after the weekend. I realise that I started this blog as an add on to the original platform I was going to be using for this student advice project, which was (and is!) YouTube. However, I haven’t dedicated any time here on the blog to filling you in on how that YouTube channel is going to work, and why I chose to start the project on that platform! My love affair with YouTube began back in about 2010, when I started watching beauty vloggers like Pixiwoo, Louise from Sprinkle of Glitter, Fleur de Force and Kandee Johnson. I loved the relationships that could be cultivated through these videos – it was like a whole new world opened up. These ordinary people were able to make videos discussing anything they liked, and then talk to people in the comments below, sharing tips and advice and ideas. I got such a thrill from clicking on my subscription box and finding that one of my favourites had uploaded a new video, and over time I discovered that YouTube was a hub for more than just beauty fanatics. There were communities for books and gaming and films, and vloggers recording their daily lives for the world to see. I loved it. I started my own channel in 2012 and uploaded fairly sporadically until I headed off to Australia in 2013 – I made a point of vlogging my whole trip, and got addicted to the process of filming and editing. I’m naturally a very chatty person, so YouTube proved to be the perfect platform for me to ramble away on! 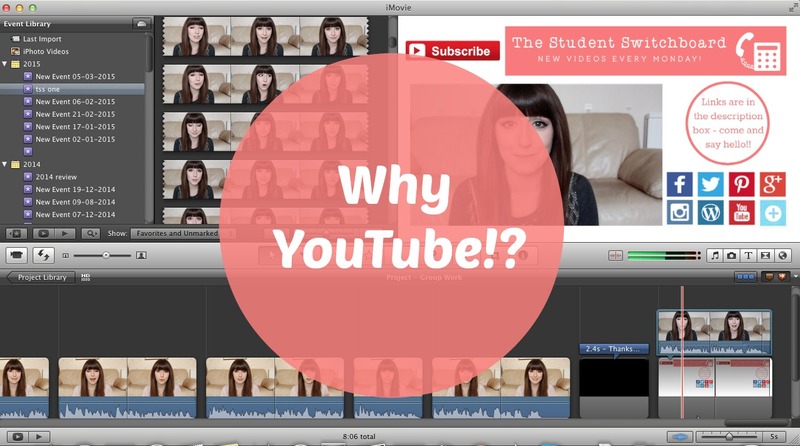 So when I decided to start The Student Switchboard, there was no doubt in my mind that YouTube was going to be a huge part of it! As a social platform, YouTube has seen a lot of massive changes in the past two years or so – some vloggers have grown to incredible heights of six and seven million subscribers, releasing books, appearing on television and at red carpet events, and becoming a brand new type of celebrity. The way things are run behind the scenes has changed, with companies managing YouTubers in a way that they didn’t used to, and the awareness of their existence has seeped out from the YouTube community and into the mainstream (to a certain extent!). Despite all of these changes, I still love it for the same reasons I invested in YouTube in the earliest days! I still love the way it can connect people, and the feeling I get when I hit the publish button on a new video. I love the fact that you can leave and reply to comments (which, of course, can have a downside when it comes to some not so nice internet users), and start to generate a real community feel with your subscribers. I also know that a huge portion of the people who regularly watch YouTube videos are at high school and making decisions about their future and continuing with their education. For all of those reasons, I’m thrilled to have The Student Switchboard channel up and running! Today, the fourth video, which deals with the challenges Group Work can present, will go live on the channel, and I would be so pleased if you checked it out! I’ll link the first three below, and I’d love your feedback :) You can click here if you’d like to subscribe to the channel, where a new video will appear every Monday at 6pm! Thanks so much for reading and following along with this project everyone, and I’ll be back again on Wednesday! Let me know in the comments, if you’re a YouTuber (or YouTube fan!) yourself – what do you like most about the YouTube community? Next > 5 Reasons Not To Skip Class!